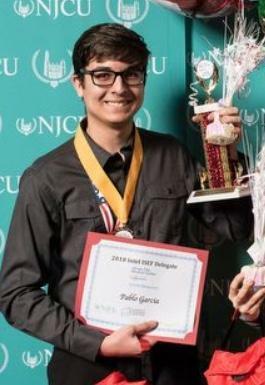 Pablo Garcia, an 11th grade student at Union City High School’s Academy for Enrichment and Advancement (AEA), has been awarded a 4-year college scholarship valued at $250,000 for his work in the International Intel Science and Engineering Fair held in Pittsburgh. This is the largest and the most prestigious Science and Engineering Fair in the World. One of 1800 students from 85 nations and all 50 states selected to participate in the fair, Garcia is a junior and will decide in his senior year whether to attend the University of the Sciences in Philadelphia. As a winner at Intel, he has other opportunities. Two other AEA students - Emely Urbina and Ramzi Saber - also attended the International Intel Science and Engineering Fair as Observers. They both won gold medals at the Regional STEM Showcase that took place at Liberty Science Center last March. Supervisor of STEM Education Nadia Makar thanks all of the teachers who helped Garcia: Dr. Barrios, Mrs. Donnelly, Mrs. Melgar, Dr. Cortina and Mr. Cheung. “You have demonstrated that team effort produces great results,” she says. Superintendent of Schools Silvia Abbato congratulated Ms. Makar, the other teachers and the students who participated in the science competition.